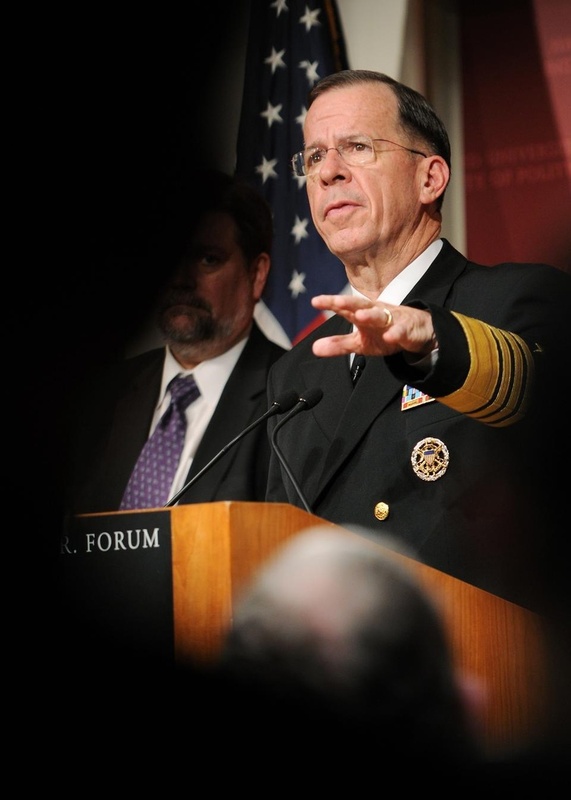 Admiral Mike Mullen, Chairman of the Joint Chiefs of Staff, spoke at the IOP yesterday. Harvard President Drew Faust, in her introduction, made clear that she would welcome ROTC back to Harvard's campus if "Don't Ask, Don't Tell" were repealed. Harvard University will “fully and formally” recognize the long-banned Reserve Officer Training Corps program upon the repeal of “don’t ask, don’t tell,” University President Drew G. Faust said yesterday at the Institute of Politics. In an introduction for Adm. Mike Mullen—the chairman of the Joint Chiefs of Staff—Faust made her strongest comments to date against the policy, which bans gays and lesbians from openly serving in the military. Faust has previously conditioned ROTC’s return to Harvard upon the policy’s repeal, but yesterday marks the first time that she has explicitly said that her administration would welcome ROTC back to Harvard’s campus. “As a further embodiment of that tradition [of service], a ROTC program open to all ought to be fully and formally present on our campus,” Faust said to a ringing round of applause. Mullen, who was the primary speaker at yesterday’s event, has forcefully said that he personally believes “don’t ask, don’t tell” ought to be repealed. He said he thinks it is “incredibly important” to have ROTC units at institutions like Harvard, adding that the policy’s repeal is up to Congress. In her remarks, Faust spoke in precise terms about the program’s return to Harvard and cast military service as part of the University’s broader mission of serving the public interest. “I want to be the president of Harvard who sees the end of ‘don’t ask, don’t tell’ because I want to be able to take the steps to ensure that any and every Harvard student can make the honorable and admirable choice to commit him or herself to our nation’s defense,” she said to an audience of ROTC cadets and large numbers of members of the armed forces and veterans. 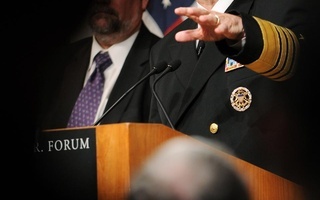 Mullen did not address “don’t ask, don’t tell” during his prepared remarks but said in response to a question from Harvard Kennedy School professor David R. Gergen that he would do everything in his power to bring a ROTC unit to Harvard. Currently, Harvard’s ROTC students regularly commute to MIT for physical training and classes. The program left Harvard in 1969 over discontent surrounding the Vietnam War. But Harvard’s at times fractious relationship with the military has in recent years been driven by what the University says is the Pentagon’s discriminatory policy toward gays and lesbians. Gergen, an adviser in the Clinton White House during the enactment of “don’t ask, don’t tell,” said in an interview that all the individuals who had played an intimate role in crafting the policy—himself included—had since changed their opinion of it and now favor its repeal. Mullen’s lecture shied away from the debate over that policy and, instead, addressed the need for a flexible military strategy during times of war. Citing examples from the American Civil War, the Korean War, and the Cuban Missile Crisis, Mullen argued that civilian policymakers must skeptically evaluate the advice of their military commanders and entertain the possibility of altering their military plans mid-way through a conflict. Mullen added that a critical part of any military intervention in today’s world was the post-conflict process of economic and political development. “It’s got to get to a point that young men and women... have a better path than putting on a suicide vest,” he said. —Staff writer Elias J. Groll can be reached at egroll@fas.harvard.edu. —Staff writer William N. White can be reached at wwhite@fas.harvard.edu. Earlier this week University President Drew G. Faust made her strongest overture yet to the possibility that the Reserve Officer Training Corps might return to Harvard if the military’s “Don’t Ask, Don’t Tell” policy ends as expected. But despite her recent remarks, the unit’s return to campus remains highly uncertain due to low levels of enrollment, limited Pentagon funding, and logistical hurdles. We believe that the most effective way to eradicate discrimination within the military is through the involvement of progressive and powerful institutions such as Harvard. Hours after President Drew G. Faust led a ribbon cutting ceremony celebrating the repeal of the military’s “Don’t Ask, Don’t Tell” policy and the return of the Naval Reserve Officers’ Training Corps to Harvard, Lecturer Timothy P. McCarthy ’93 and a number of students spoke out against the University’s decision. Harvard College does not limit free speech; it celebrates it. Instead of suppressing student opinion, the College invited it.